With two delicious series going, each with a new book out over the next six months, author Gigi Pandian still managed to find time to chat with me, and I’m thrilled. Her adventure-filled mysteries are among my favorite series. How do you know if you’d like them? If you’re a fan of Elizabeth Peters, either her Vicky Bliss or her Amelia Peabody series, then you will love Gigi’s books. We talk about a lot of things, and one of them is food. Dorian, the gourmet chef (and living gargoyle) from The Accidental Alchemist grumbles about it, but he manages to create masterful dishes with only vegan ingredients. Gigi has a treasure trove of recipes on her site for you to try as well, and don’t miss her Pinterest board! Gigi’s interests are so wide-ranging — alchemy! mythology! world travel! — that I’m not going to try to encapsulate it all here. Instead, let me suggest you follow her on Facebook and subscribe to her newsletter. Little doses of wonderment await. 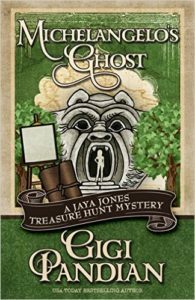 And joy — did I mention what joyous romps the Jaya Jones Treasure Hunt Mysteries are? There, now I did. 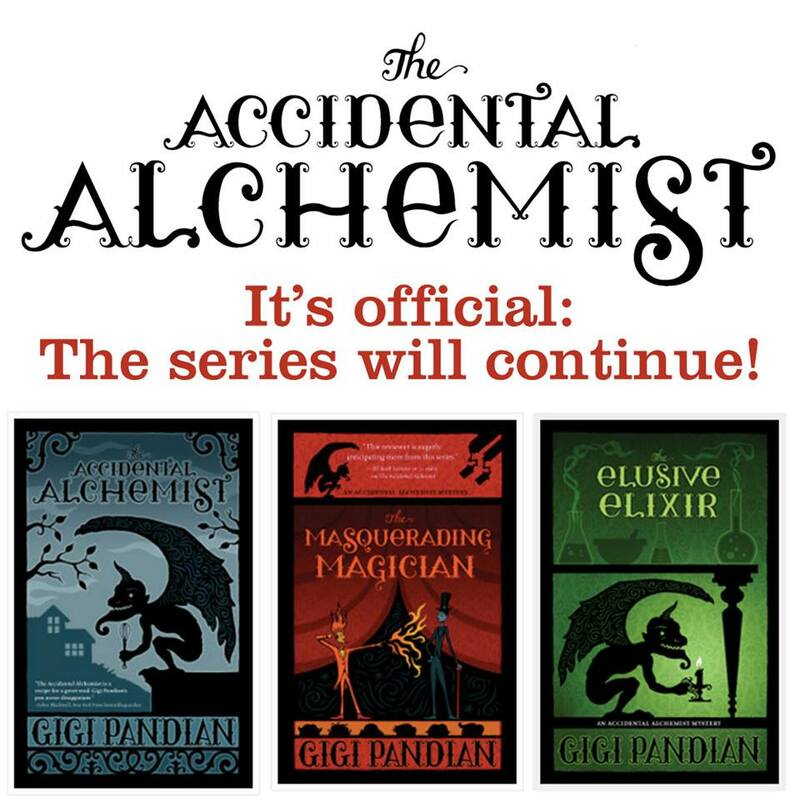 Plus Gigi just shared some great news about The Accidental Alchemist series: her original three-book series has been extended! There will be more adventures for Zoe and Dorian ahead. As always, if you’d prefer to read rather than listen, here is the transcript. Enjoy! Laura Brennan: My guest today is USA Today bestselling author, Gigi Pandian. The Accidental Alchemist won this year’s Best Novel Lefty Award, while Artifact, a Jaya Jones Treasure Hunt Mystery, was named a Best of 2012 Debut Novel by Suspense Magazine. Lucky for us, both of these mysteries launched excellent series. Gigi, thank you for joining me. Gigi Pandian: Thanks so much for having me today. LB: Your very first novel was Artifact. LB: And that was the first outing for Jaya Jones. LB: The subheading for that is “A Treasure Hunt Mystery.” Which came first? Did the treasure hunt aspect of it come first or did you come up with the character first? GP: So the whole idea for the series was always there right from the start, mixed up with Jaya and her friends and the whole adventure of it. But I hadn’t really figured out that it was a treasure hunt mystery series because when I wrote the first book, I was just concentrating on the first mystery. And so I knew that it was an adventure that became a treasure hunt, but it wasn’t until I was thinking about, as all authors have to do, how do you actually pitch your book to other people, that’s when I realized that that was really what I wanted to be doing for a whole series. Because I love adventure mysteries, and so it was definitely the thing that I wanted to hook the series around. LB: It is such a joyous romp. I love that book. LB: It’s so full of the twists and the surprises. You said it kind of sprang full-formed? GP: The idea for the adventure of it, that it wouldn’t be something that was just set in one place. That it would be an adventure that was following clues that lead to different foreign destinations and that there would be twists and turns. I just, when I started writing it, I hadn’t figured out exactly what those twists and turns were. And it’s actually one of those things that is really funny when I look back on it, that I’ve always thought of myself as an outliner, someone who knows exactly what the story is before I sit down to write. But what I’ve realized is that every single book I’ve written, whenever I start with an outline but then I sent my characters free to go follow that outline, they do not follow my outline. They insist on doing their own thing and following their own path and so I’ve just, I’ve gone with that. And that works for me. But it’s funny that I still think of myself as an outliner after all these years. LB: Let’s talk a little bit about you. How did you get started writing mysteries? Where did that come from? GP: Ever since I was a kid, mysteries were always my favorite thing. So my parents are both professors, and I grew up in a house filled with books of all different genres. But it was always, ever since I was little, it was always the mysteries that I was drawn to. And even in kids books, Scooby Doo was my favorite when I was little, both the TV show and the Scooby Doo books. And so I started writing my own Scooby Doo stories when I was a little kid, because there weren’t enough Scooby Doo adventures, I had to make more of them. LB: That’s really interesting, what you said about how you grew up with all sorts of different books around and, you know, your parents were both academics and so you had all of this diverse stuff in your house. LB: Because you, in your books, you layer diverse histories and pathologies and stories and superstitions and — is that deliberate on your part or does it just come naturally? GP: I’m very fortunate that I’ve gotten to travel a lot with my parents since a young age. My parents were both cultural anthropologists before they retired, and my father is from India. So between the two of those things I did a lot of world travel starting when I was young, beginning with my summer trip to Scotland when I was 10 years old because my mom had to go to some follow-up research there, in the Highlands of Scotland that summer. She thought that would be a great experience for me. And so she took me along over our summer vacation. And I was hooked on all of the mystery and the ghost stories and climbing on all these ruined castles. It was just amazing. That was always, since that captured my imagination from a young age, even though I didn’t know what I was going to do with it later in life, all of those travels since I was a kid really inspired me. And all of that made it into my books once I started writing as an adult. LB: And it’s fun to see how interconnected world history really is. GP: Yeah! No, that’s one of the things, since my parents are from two different countries. That was just a natural part of something that always made sense to me, but I didn’t see out there is much it should be. I wasn’t doing it to make any sort of statement, but just because that’s what made sense to me in the world. And so it was a fun thing to incorporate into the books. LB: It makes for a very rich mystery. Also your main cast tales from all over the place. LB: We’ve got Russia, we’ve got England, we’ve got India, we got everybody. GP: And that was another thing, too, that I — I was recently on a panel discussion with other mystery writers of color, talking about the reason that they chose to write a diverse cast. And something that I was realizing about my own books was that, it’s funny how the mind works. It was never something that I did consciously when I was setting up my cast of characters. But that was just the world, that was just my world that I experienced, and so of course that I would want to put characters that, yeah, were part of my experience into the books. LB: So if someone hasn’t yet picked up that series, what would they need to know about Jaya? GP: If you are a fan of Elizabeth Peters and her wonderful adventure mysteries, that series is the closest comparison to the Jaya Jones Treasure Hunt Mysteries because they are twisty-turny mysteries that involve adventure and foreign travel and romance. And it was Elizabeth Peters’ novels that really inspired me to become a mystery novelist. One of the things that’s most amazing to me about being an author is that reviewers and readers have compared my books to Elizabeth Peters’ novels. Which is really meaningful to me. LB: Those are the Vicky Bliss novels in particular, right? GP: The Vicky Bliss ones are the ones that are closest to the Jaya series, but the Amelia Peabody ones capture the same spirit of adventure too. But, yes, it is the Vicky Bliss books. LB: There’s also, there’s love and there’s romance, and there’s also, who do you trust? Can you trust the good-looking guy who just happens to show up at the right time? GP: So there’s actually, if there are any diehard Elizabeth Peters fans listening, one fun thing is that I have a nod to Elizabeth Peters books in each of my novels. So it’s not something that’s distracting, but if you are an Elizabeth Peters fan you may pick up on the subtle references to her books in each of my novels. LB: Would that be Lane Peters’ name in the first one, or is there another one that I missed? GP: There actually is, that I don’t want to give away as a spoiler. LB: No! Do not spoil. GP: Yeah. I will tell you off-line, and if anybody contacts me personally, I would be happy to tell you, but otherwise I will not give it away as a spoiler. LB: Oh no! That gives me a reason to reread. Don’t tell me. Don’t tell me. Well, that’s fine. 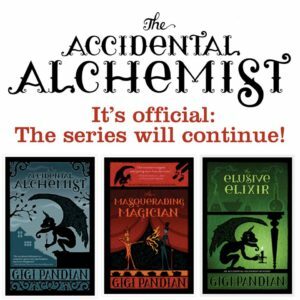 Now The Accidental Alchemist is your second series. LB: And I want to talk about some of the similarities, but it also has a very different feel to it. Where did the idea of The Accidental Alchemist spring from? GP: The Accidental Alchemist, about a centuries–old female alchemist and her impish gargoyle sidekick, who was once stone but was accidentally brought to life through alchemy — that series was really my cancer book. So I, five years ago, was diagnosed with breast cancer when I was 36 years old. And I had a year of cancer treatments ahead of me because it was really aggressive cancer. And so while I was going through chemotherapy, this was a book that I wrote during that time. Ideas like the elixir of life and alchemy were very much in my mind at the time. It had already been a subject that interested me, but that was really when I sat down to explore the things. But because my natural writing voice is not a dark voice, what I ended up having after that cancer experience was a great idea for a book, but my rough draft of that book was way too dark and was not my voice at all. And so I’m like, huh, there are some really good ideas in here, but this is not quite what the book needs to be. So when I rewrote it as a proposal and showed it to my agent, it was much more in the adventure, lighthearted voice of my first Jaya Jones series, but it did explore some weightier issues. But it’s not a dark book even though it came out of that dark place. LB: No, it’s not a dark book. But it, it’s not only the dream of eternal life, it looks into the responsibilities and the heaviness that can come with that, especially when it was by accident. GP: Right. Right. Who wants to live forever? LB: Yes. By the way, I love Dorian. GP: Oh, yay! I love Dorian too. He’s a character that I didn’t really imagine. He kind of took over the book. He was specially much more in the sidelines. But then he completely took over that series. Which is wonderful, but I didn’t plan on it. LB: And he can come cook for me anytime. You’re fascinated with gargoyles though, right? GP: Yes! That was one of the things, ever since that first trip to Europe when I was 10 years old, actually have some of the really really bad photographs that I took on the film camera at that time. Gargoyles represent all things mysterious, and ever since that first trip, exploring ruined castles and foggy moors and all of these old churches with these mysterious gargoyles on them, I’ve always thought gargoyles were amazing. Ever since then. LB: So for your first book, it sort of sprang, the whole idea of the story came to you. Now when you sit down to write the next novel in the series, does the mystery come first? Like do you have an idea of the plot at first, or is there something you want your protagonist to go through and then the mystery comes out of that? GP: It’s very much mixed up together and I’m not able to consciously pull it apart. That’s the reason that, actually, I write in a paper notebook for months and months before I even move to the outlining stage on a computer, because I really just need to jot down notes to figure out what the characters — what type of mystery the characters would be solving and where the characters need to go. I have, for my day job, I have a commute on the train to go to work that’s about half an hour. And I can’t read or I get motion sickness, but I can write in a notebook as long as I don’t read back over what I’ve written. It’s a wonderful forced time of solitude since I can’t be reading while on a moving vehicle of any kind. There something magical about the train, so I’m just able to explore all of those ideas about plot and character and really figuring out where the next book should go, all together. And then at some point ideas just click together for the mystery and where the characters need to go. And for my next book it happen most recently just last week, that I was on a train, a different train, but I was on a train and it just clicked for me, the ideas that I had been filling into a notebook, exactly what needed to happen. So, magical trains. That’s the take away. LB: Magical trains. Well, there’s another take away which is that you’ve faced obstacles: cancer treatment, motion sickness, right? And in both cases you’ve really found the gem in each of them. You’ve turned them both to art. I’m awestruck. GP: Cancer really did give me the ‘seize the day’ mentality. That was what made me throw myself much more seriously into my writing. I was going about it, it was very fun before that, but I was just doing it slowly and just waiting to see what would happen. But I really was able to take charge of it after cancer because if I can beat that, I’m not going to sweat the small stuff. I’m going to do what I want to do with my life. LB: This is going to sound silly, but in your two series there’s a difference in how the characters eat. LB: So Zoe is a vegetarian. And I understand you’ve become a vegetarian, right? GP: She’s a vegan actually. GP: I am a not quite vegan. Zoe and Jaya are my post-cancer and pre-cancer selves in terms of their eating habits. In their broader lives they’re not exactly me, but I ran with it for the food thing. I had always been someone who is a very adventurous eater before cancer. I would be that person who goes to a foreign country and would eat anything that you put in front of me, that was very much part of my identity, to eat everything. But then after I learned about my particular cancer markers and had different food restrictions, I decided I wanted to eat every bit as wonderfully as I had before. I wasn’t going to let my restrictions stop me. And so I took cooking classes and learned how to cook. One of the easiest ways to be able to meet my food restrictions is doing a vegan diet. That’s why I’m mostly vegan. But that allowed me to learn all of these amazing ways to cook great vegan food, so that’s why I gave Dorian the challenge since Zoe is a vegan. He can still cook his French delicacies, in a healthy vegan way. LB: Yes. Minus the bacon. GP: Yes. And it’s amazing. I do not miss bacon. You do not have to miss bacon if you gave up meat. There’s all these other ways to get at that same type of sensation for your mouth. I was very surprised that I do not miss bacon. LB: Well, what is next for you? GP: I am, right now, I turned in my edits for the fourth Jaya Jones novel, Michelangelo’s Ghost, that’s coming out in October. Now I’m getting myself a little bit of a break before I dive back into writing the next book. I have a writing notebook that I’m taking with me everywhere and just writing down notes, just to see what I want to do for the next books and where the characters should go. It’s really nice, I had some crazy book deadlines for the last couple of years and now I have a little bit more breathing room before my next deadline. So I’m giving myself that time to explore. And I’m also very excited about that book release of Michelangelo’s Ghost in October. LB: And then you have another book release in, is it in January of 2017? GP: Yes. That’s the third Accidental Alchemist novel, called The Elusive Elixir. Zoe and Dorian’s adventures continue in that book, and that was a lot of fun because the Accidental Alchemist series is set in Portland, Oregon, and I also, the characters take a jaunt to Paris, France in this book. And so it is set about half in Portland and half in France. And that was fun, because I always have to go research my books. So, it’s a tough life but, have to get things right. LB: No, you have to. You have to. LB: So, you are very well-traveled. What do you think is the biggest benefit of that? GP: In terms of writing, or in terms of life in general? LB: Whichever one you’d like to answer. GP: The Internet has brought us closer together in so many ways, but I find that you don’t realize until you actually visit a place that there are so many things that you can’t get remotely. So even though I will go research, do a lot of research online and in books before I travel to a country, there’s something about experiencing a country and the people and its culture and the tangible taste and sights and smells and everything. It’s just fundamentally different. And so even thoough there are so many wonderful opportunities to learn from each other online, I think that people should remember that it’s not the same. So that if you are able to go experience the world, I think it really brings us closer together and shows what things are really like. LB: Is there anything else? What else, what have I not asked that you want to talk about? GP: Well one thing that I would love to say is a big Thank You to all of my readers who took a chance on two series that don’t quite into the normal mystery marketplace. Because one of the things that was difficult in me selling my books at first is that they’re not quite cozy mysteries. They appeal to readers who have cozy sensibilities but they’re not quite like other cozies. That was something that really was a hurdle, and so I just feel so honored that people have wanted to pick up the books and champion them. So, that’s been really lovely. So thank you. LB: Gigi, thank you so much for joining me today. GP: Laura, thank you so much for having me.